Governments worldwide are looking for ways to better manage budgets in an era of fiscal constraint. At the same time, many are searching for new ways to tackle persistent social issues where results have been limited. Non-profit organizations, together with private investors, may have answers that could help shape how capital is accessed to achieve social outcomes in the future. 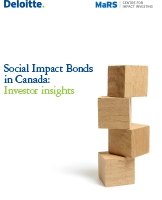 One example is through the use of the Social Impact Bond (SIB). A SIB is a new multi-stakeholder partnership agreement created to raise private capital to fund preventive interventions. This potentially disruptive innovation draws on assets from across sectors to transform the way we respond to social problems. For non-profit organizations, it provides a new, outcomes-focused funding model for expanding or replicating successful social programs. This technical guide is tailored for non-profit social service providers. It aims to help organizations understand what a SIB is, their role in the model and the development process for SIBs.